Do your students struggle with understanding what a writing prompt is asking them to do? 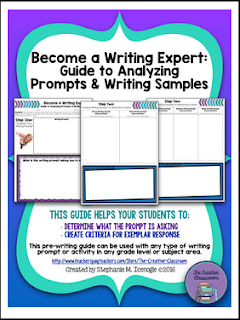 Are you looking for a way to have your students be responsible for creating the criteria for an exemplar writing response? I have created this two step guide that is based on the steps that I have used in my own classroom to help students better understand what a writing prompt is asking them to do and having students analyze writing samples to determine the criteria for their writing response. This guide will help teachers to determine student understanding of the writing prompt and correct any misconceptions BEFORE students begin writing. After students have identified what the prompt is asking them to do, they will analyze strong and weak writing samples to identify the characteristics of writing in each sample. This will help students determine what criteria their own response needs to include to be a strong writing response.